Don’t let a point of sale outage hurt sales and ruin the customer experience. Internet downtime can rack up thousands of dollars in lost revenue. A negative user experience can hurt your business and ultimately cause customers to move to a competitor. 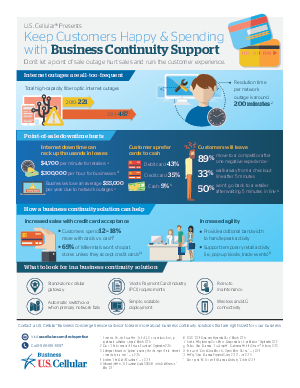 A business continuity solution can help provide additional bandwidth to handle peak activity and support temporary retail activity.